After being elected in January, 2008 one of the first acts of the David Thompson DLP Government was to change the law protecting 265 acres of parkland at Graeme Hall to allow developer friends to profit from these public lands. To make this happen, David Thompson and the DLP Members of Parliament had to set aside laws that had protected the land from development since 1988. When the government was finished, 2/3 of the parkland (175 acres) was gone. [Bridgetown, BARBADOS] A land use map depicting the planned loss of parkland at Graeme Hall has been released this week by the Graeme Hall Nature Sanctuary. Titled “Parkland Loss Planned at Graeme Hall,” the new map (www.graemehall.com/press/papers/ThenNowMap1.pdf ) illustrates the Government’s plan to allow residential and commercial development on government-owned Graeme Hall land. 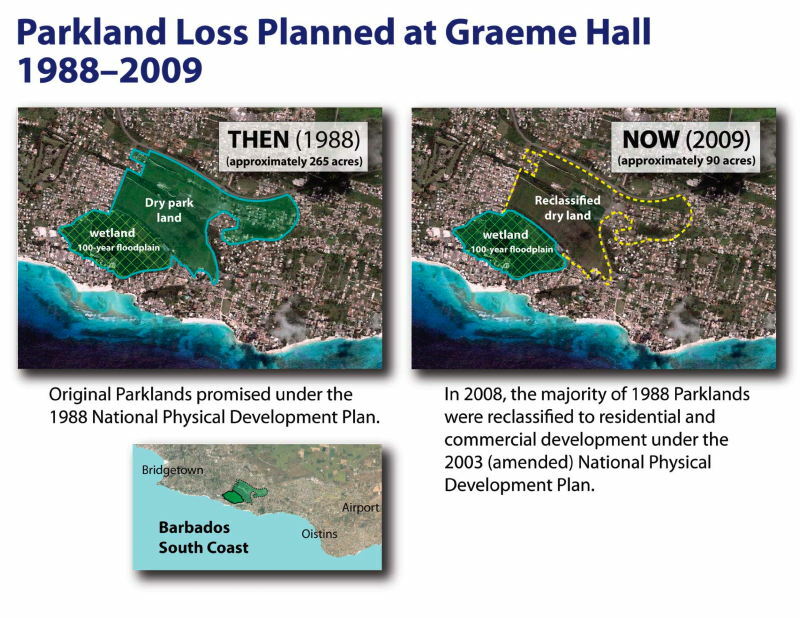 Contrary to the original 1988 National Physical Development Plan (PDP), the new 2003 PDP recommends that parkland at Graeme Hall be limited to the flood-prone Graeme Hall Swamp, and that all dry land be developed. Graeme Hall Nature Sanctuary officials are critical of the land use change, saying that urban development of Graeme Hall would be akin to developing Central Park in New York, and that wetland buffers and recreational opportunities would be permanently destroyed. Sanctuary officials also cited recommendations from the Urban Land Use Institute quality-of-life recommendation of 25.5 acres of parklands for every 1000 people. The move to convert the Graeme Hall parklands began after the Sanctuary was acquired by Peter Allard in the 1990’s. Allard, a retired Canadian attorney and investor, purchased the Sanctuary lands after due diligence examination showed that the 1988 PDP designated the approximately 240-acre green space at Graeme Hall as an environmental, recreational and agricultural buffer for the wetland, and as a green corridor between Oistins and Greater Bridgetown urban areas. Parliament ratified the land use change in early 2008 despite a petition signed by 6,000 Barbadians to preserve the 240-acre Graeme Hall area as a National Park. Located at www.graemehall.com/press/papers/ThenNowMap1.pdf, the new map derives its information from Map 20 of the 1988 PDP, and Maps 4 and 6 of the 2003 PDP. These maps can be located in the “Map” section of www.graemehall.com/reference.htm. Graeme Hall contains some of the highest concentrations of biodiversity in Barbados and is the last major urban green space over 200 acres available as a regional park on the South Coast. Now we know: Barbados Government officials are in fact doing nothing to protect or secure deportees’ valuables. It is a free-for-all with neighbours, landlords and passersby grabbing the “abandoned” property and money of arrested persons. Our authorities are doing nothing except dragging persons away from their rooms and homes. So far there are no reports of government officials ending up with deportees’ property, but where there is no system used to properly seize, protect and catalogue the property of arrested persons – it is only a matter of time until the abuses start if they haven’t already.